Driftsun has created a new two-person kayak which allows you to enjoy both what’s above and below the waves due to its transparent design. 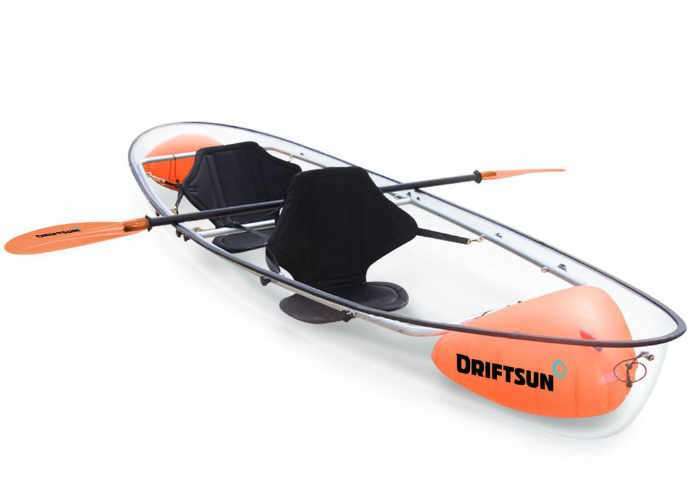 The Driftsun Transparent Kayak is now available to purchase priced at $1,600 which includes free shipping throughout the continental US. The Driftsun Transparent Kayak hull is constructed from 100 percent Resistant Polycarbonate which is attached to an anodised aluminium frame, enabling a carrying capacity of 425lbs. Look what you’ve been missing! Paddling across the water is a peaceful way to take in the natural beauty of lakes, rivers, and oceans. Now you can see what’s going on beneath the surface. The Driftsun kayak-canoe hybrid features a completely transparent hull so you can enjoy the benefits of snorkeling without getting wet. Watch marine life through the durable, crystal clear, polycarbonate hull. The kayak includes a pair of adjustable, removable seats so you can custom configure the interior for one paddler or two. Designed to handle a variety of conditions, this kayak has been tested in both calm and choppy waters. Turn heads on your next outdoor adventure with this clearly different ocean kayak. Jump over to the official Driftsun website for full specifications and the ability to order via the link below.